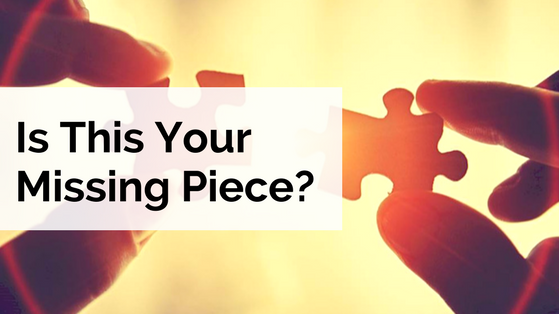 Is this your Missing Piece? Maybe you’ve tried every investment fad that’s come along. You’ve started and stopped a dozen different programs, perhaps worked with a financial advisor, but the truth is you just can’t seem to make the financial progress you want (or simply feel like you are sinking into financial quicksand.) Perhaps you’re even feeling a little disgusted with yourself and your inability to control your spending habits because you have no idea how much or on what you are spending. You feel like no matter what you try, it’s not going to work. You might feel comfortable with investing in general, but you need to shore up some other financial pieces. For example, you have questions about liability insurance, business structure, trusts and wills, and so much more. You might be asking yourself, “Do I even need a trust?” You might want to set up your retirement and college savings withholdings so that you don't have to worry about how much you’re saving. You may feel like you are paying way too much in income taxes. Perhaps, you’d even like to manage everything yourself, but you want to have the peace of mind of having a "money guy" to call with questions and to keep tabs on the big picture so that you don’t fall into a financial hell that you can’t crawl out of. Maybe you feel like you are the same as any regular person working weekly to make a paycheck, like a hamster that must run on the wheel for food and water to come out of the dispenser. Perhaps, your hope is to create a plan that will allow you (and your family) to eat without constantly expending 100% of your own effort to spin the wheel. On the other hand, you want to pay a fair cost for the services of a professional and for the accountability. You understand that folks are in business to profit, but you don’t want to be taken unfairly advantage of. You don't want to end up becoming that doctor whose retirement account is cut in half by fees. Once upon a time, taxes, investments, & financial planning were straightforward and simple. The world operated in what was a relatively sensible manner where doctors were treated with dignity and respect. We both know today is a completely different environment. It’s noisy, chaotic and every other TV or Radio ad is about investments or taxes of some sort or other which with so many choices in front of you, you often do nothing out of fear of making a wrong choice. Being a physician in 2017 is no simple task and in this day and age of “bright shiny investment & tax objects” that are nothing more than a cheesy gimmick, you might think the latest funny investment or tax commercial is the answer to all your problems. I doubt it. 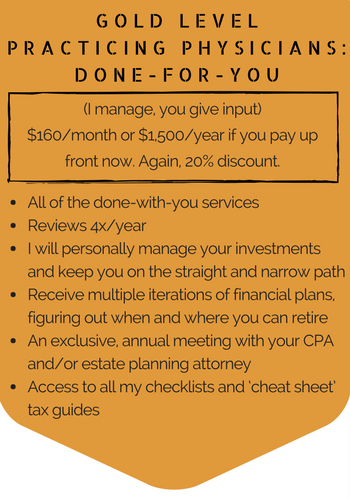 So many so-called investment & tax professionals have forgotten the true fundamentals of how to PRO-ACTIVELY manage their debt, their taxes, & their investments. In the past, you have reached out to me with a question or answered one of my surveys. Which is why I am extending a special offer just for you. This is not some re-hashed and regurgitated, “been there, done that” service either. I literally spent weeks & months distilling down the essential ingredients every doctor should have in working with a financial advisor. I talked to dozens of physicians to figure out what was fair and what a physician like you desired. By this point, you may be sitting there wondering, okay… what is it that you want? What is it that you are offering? Many physicians have told me that they want a shoulder to lean on. They are looking for someone to bounce ideas off of and figure out how they can tweak their situation. However, some folks want to get together more often and others less often. Discussing your situation with you as the ‘CEO’ to help guide you in making informed decisions. We may get together once a year, twice a year, four times a year, or even six times year. Determining what risk level is most appropriate and how that impacts what investments are the best fit for you. Giving you guidance on how to invest in your retirement plans. 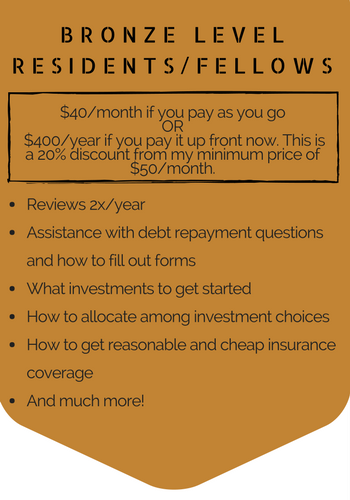 Creating a debt-elimination plan to be free of student & consumer debt within 10 years. Learning whether or not you may be a good fit for a “Back-Door” Roth IRA or a “Super Back-Door” Roth IRA and how you get make the contributions while minimizing (or possibly eliminating) the taxes for the conversion. Discuss specific strategies for minimizing your taxes and how your investments coordinate with that. Working with your CPA and attorney to determine whether a S-Corp or LLC may be a good fit for your practice or side-hustle income. Determining whether a defined benefit plan may be appropriate for you and how to implement it. Learning the difference between static or tactical allocation and determine what is right for you. Managing your investment accounts or giving you feedback on what specific investments to choose when you invest on your own. You may be thinking… this all sounds good… but how much does it cost me? The folks at compliance will remind me that every situation is different. However, I have to be honest. I’ve been struggling the last year or two to figure out what is a fair price. I’ve been re-evaluating my business and trying to determine how best to charge for these services. Many clients pay me hundreds of dollars each month to do so. Some pay me far more than that. Some pay far less. I am sick of this variation between clients and I am looking to simplify the process. Because you are part of my community and maybe we’ve already talked, I’d like to extend to you an incredible offer. NOTE: This will only be available FOR THE NEXT TWO WEEKS to 5 people per level and then the discounts will disappear… probably forever if you want to work exclusively with me. You could be saving more than $8,000 a year in fees on a million dollar portfolio. Imagine that… paying reasonable fees for reasonable value. Instead of having no idea what you are paying from month-to-month, you will know exactly how I am getting paid each and every month. On top of that, I am offering you a DISCOUNT if you pay up front for a whole year. 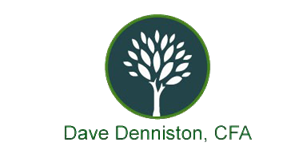 In addition, I promise you that I will NEVER sell you an annuity, disability, or life insurance policy unless it is something that you request or want to know more about. This is the best promise that I can give you and still be in compliance with the securities laws (which believe you me are very strict). If you don’t do something, the delay on making a decision could get worse. You could get behind the eight ball and be in a position where you are today, or maybe even take a few steps backward. If you are like many doctors that I speak with, you aren’t tracking what you spend. You have no accountability and you are on the road to where you won’t be able to retire until past 70. My friends, you can’t ignore this problem anymore. If you don’t solve it, it could cost you the best years of your retirement. You’re at the point of decision. You can either continue down the path of least resistance, the path you have already been traveling, or you can choose the road less traveled. The path of least resistance will probably result in you getting the same outcomes you’ve always received. Make a new choice, and pursue your new outcome. But if you want something different to happen, if you want to change the direction of your finances (or your relationships, or your health, etc.) you’re going to have to do something different. Bronze Level… Residents/Fellows: $40/month if you pay as you go OR $400/year if you pay it up front now. 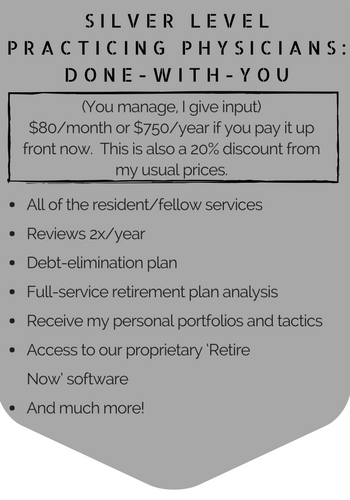 Silver Level: Practicing Physicians: Done-With-You (You manage, I give input)- $80/month or $750/year if you pay it up front now. Gold Level: Practicing Physicians: Done-for-You (I manage, you give input)- $160/month or $1,500/year if you pay up front now. The choice is yours my friend. I encourage you to take action now and get that help that you’ve been looking for… at a reasonable price! P.S. Remember… this will only be available for the next two weeks to 5 people per level and then the discounts will disappear… probably forever if you want to work exclusively with me.